Flatiron Building, New York, N.Y. Detroit Publishing Co., c. 1900-1905. Library of Congress. Nicknamed the "Flatiron" for its distinctive triangular shape, the freestanding, three-sided tower, was a popular success from its completion in 1903. 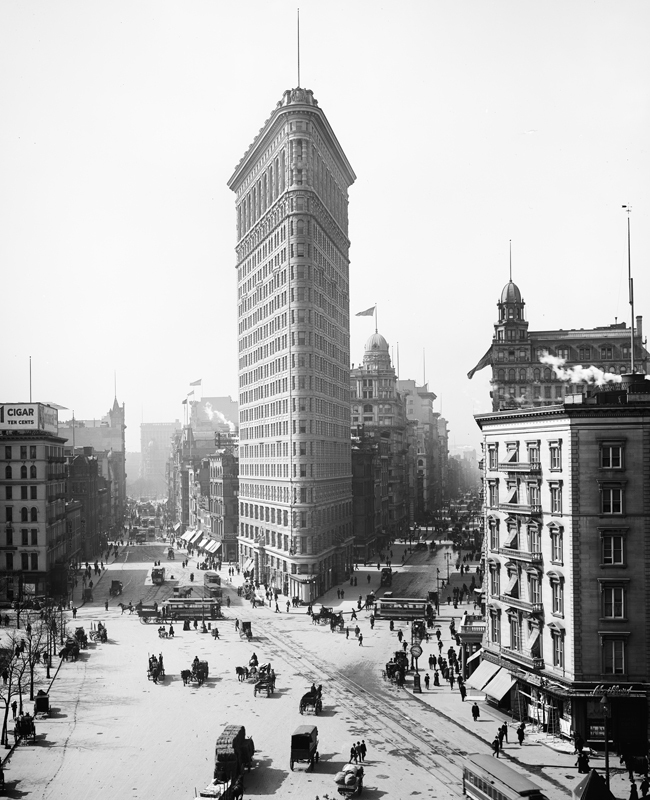 Because it occupied an extraordinary site-the visual- and high-traffic urban corridor where Broadway cuts diagonally across Fifth Avenue at the extra-wide 23rd Street, the Flatiron seemed to concentrate the attention of the city to its narrow prow. Entranced by its power, the modernist photographer Alfred Stieglitz famously noted that the skyscraper "appeared to be moving toward me like the bow of a monster steamer-a picture of a new America still in the making." What the slender shaft lacked in terms of an efficient floor plan and copious rentable space-its floors comprised just 5,000 sq. ft.-it made up for in celebrity. The 22-story, 285-foot tower was officially the Fuller Building, named for the firm that developed and erected it: the George A. Fuller Company. The eponymous founder had pioneered the profession of general contracting in Chicago in the 1880s, where the company had also begun to specialize in the new technology of steel-frame construction and had erected many of the city's early skyscrapers. When Fuller died in 1900, his son-in-law Harry Black took over as president and aggressively expanded the company's business in New York City and on the East Coast. Their work involved both development and general contracting. In 1898-1900, for example, they partnered with Cass Gilbert on the design and construction of the Broadway Chambers Building, which, like the Flatiron, was a speculative real estate project. Designed in the Chicago architectural office of Daniel H. Burnham, the Flatiron Building looks more like a typical skyscraper of the Windy City than of New York. The façade is composed in three parts, analogous to a classical column, with a base section of three stories, a shaft of multiple, identical office floors, and an upper zone with more ornament, capped by a projecting cornice. This same composition could be seen in a dozen contemporary buildings in Chicago, but was more unusual in New York where picturesque rooflines or medieval references in towers were more common. What made the Flatiron a classic New York skyscraper, though, was its exceptional and slender site. The ornate surface ornament that gives the stone-colored building the overall texture of elaborate tooled leather was created by the Atlantic Terra Cotta Company, as in the Woolworth Building.